This post follows a similar theme. In this case we want a tool that easily allows us to rename the CIFS Server name of many CIFS Servers in one go. Not totally sure if there’s much use case for this, but migrations/transitions is a good one. 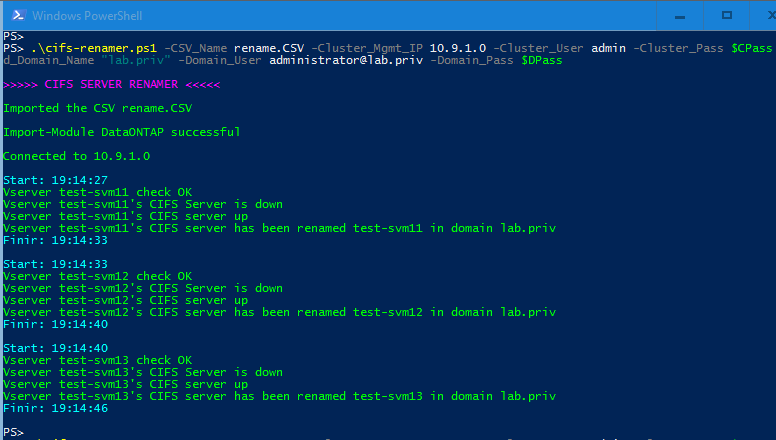 Firstly, you need a CSV with your vserver and new CIFS server name in. 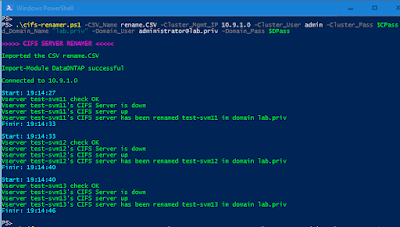 The column titles are “vserver” and “newname”. Then you run the script from down below - save as say CIFS-Renamer.ps1 - in PowerShell, answering the prompts. In the screenshots below, I’m running CIFS-Renamer.ps1 with parameters. The first run has everything green. In the second run, since we have the same data, CIFS-Renamer tells us that the CIFS servers are already correctly named. # TIP: Can use $P = Read-Host -AsSecureString, as value for pass!